For those of you who think, "I really like reading Marcus' blog, but I wish he'd write more often," I have good news. I recently joined the writing team at Vagablogging.net, a blog run by travel writer Rolf Potts. 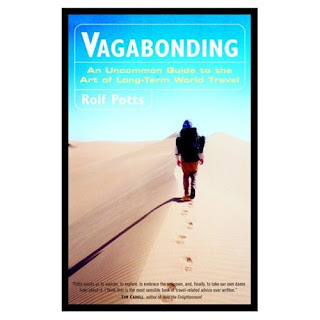 It was Potts' book, Vagabonding: An Uncommon Guide to the Art of Long-Term Travel, that inspired me to become an expat in the first place. It's a big honor to get to work with one of my role models. "Vagabonding" was a life-changing book for me, and I've been recommending it to friends ever since I first read it back in 2005. The book has the perfect mix of inspirational writing and practical advice. I'll be writing blog posts once a week, talking about different aspects of travel and living abroad. They'll go live on Fridays at midnight, as Thursday changes over to Friday. My first post is on the website now. It's the one I sent in that helped me get the job. My posts on Vagablogging will be shorter, about 200-500 words. This should come as a relief to some of my friends, who are too busy to slog through the marathon posts on my own blog! Thanks to all my friends for their unflagging support. It's by honing my travel-writing skills on this blog that I was able to land this writing job. Vagablogging welcomes six new writers! Graham Reid - A Graduate Journalist from England, Graham has spent the past year traveling around North America, including an epic East-to-West Coast bus trip. Graham's entertaining travel blog can be found here. Celine Roque - Celine is currently living in a small town in the Philippines, a country she'll be exploring for the next two years. She blogs at pimpyourwork.com, a site that encourages people to work more efficiently so they can have more time to pursue their passions. Bluefox808 - Our first Hawaiian contributor, he has studied creative writing in England, backpacked through Europe, and lived in Shanghai. He now resides in Taipei, where he maintains an excellent travel blog called Bluefox808 Adventures. Claire Litton - Claire is currently on tour as a professional bellydancer-- another first for Vagablogging-- and she's been writing professionally since 1998. Her poetry and fiction have been published in literary magazines in the US and Canada, and she's working on a nonfiction guide to bellydance. Claire tells me that "the relief [she] felt at finding Rolf's book a few years ago and thinking, 'There really are people who think like me!' cannot be described." Scott Gilbertson - Rolf's book Vagabonding was part of the inspiration for Scott's eleven-month trip around Southeast Asia. Scott has been a freelance writer for five years, and his work frequently appears on Wired.com. Scott keeps family and friends (and now you!) updated on his travels at luxagraf.net. Aly Young - Aly has moved back to Kansas after spending two years in Asia. (Sound familiar, Rolf?) She blogs and posts her incredible photographs at Another Wandering Soul.